Harvest time is one of the best times of year, especially at the farmers market. This is also a time when my neighbors and I get together to celebrate one of my favorite traditions; Annual Neighborhood Tomato Canning Day. 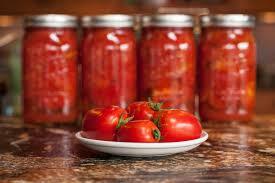 I loved the idea of canning tomatoes, but found the whole process to be a little overwhelming and a little bit scary. A few of my neighbors were old pros at it, so I trusted doing it with them. So, on a Saturday in September, we went down to the Farmer’s Market as a group to purchase our tomatoes, and then canned them at one of my neighbor’s homes. And with that one day, an annual tradition was born. As with many traditions, we have developed a typical way of going about things for our annual event. When we get to the market, there is usually a chill in the air, so our first stop is always a cup of coffee. Once we have coffee in hand, we start making the rounds to the various vendors; searching for our tomatoes. They have to be Roma or San Marzano, they must be the right size and not too green. We never purchase from the first vendor we see, because we need to check out all of our options first. Once we make our tomato purchase, we take some time to enjoy the market and all the colors and smells it has to offer; brightly colored peppers, dark purple eggplants, an abundance of apples, pumpkins and squash in multiple shades and hues. Taking it all in, visiting the market is truly one of my favorite parts of Annual Neighborhood Tomato Canning Day. After we get back to my neighbor’s house, we get to the business at hand. The guys gather in the garage where they monitor several jars of tomatoes bathing in the tubs of boiling water. They are usually joined by random neighbors that have stopped by to help supervise and watch the football game. We always have a great lunch, a few of our favorite beverages, fun stories and lots of laughs. Before we know it, the tomatoes are all out of the water bath, the kitchen is clean and one more Annual Neighborhood Tomato Canning Day has come to an end. Yes, it has been pointed out to me, it would be a lot cheaper and easier to go to the grocery store and purchase canned tomatoes. But, for me that doesn’t compare to the sense of community that has been developed and strengthened over the years through this special celebration of food. For information on canning tomatoes, Ball offers step-by-step instructions at http://www.freshpreserving.com/recipes/diced-tomatoes-in-water. You can usually find all of the canning supplies you will need at your local grocery or hardware store. There are also some helpful tools for handling the lids and jars and removing air bubbles that can be found in this section as well. Also, Food Republic has some great recipes for cooking with canned tomatoes at http://www.foodrepublic.com/2013/03/08/36-ways-use-canned-tomatoes-tonight#!slide=1. This entry was posted in Uncategorized by curtisfoods. Bookmark the permalink.